These letters from Ambrose H. Eggleston and Elvira E. Towsley were probably sent together. Samuel left Iowa in 1862 and migrated to Utah. Samuel might have written to inform his brother of this move and this may be why Ambrose thought it interesting that he had moved to Iowa after Samuel left that state (though they lived on opposite sides of the state). 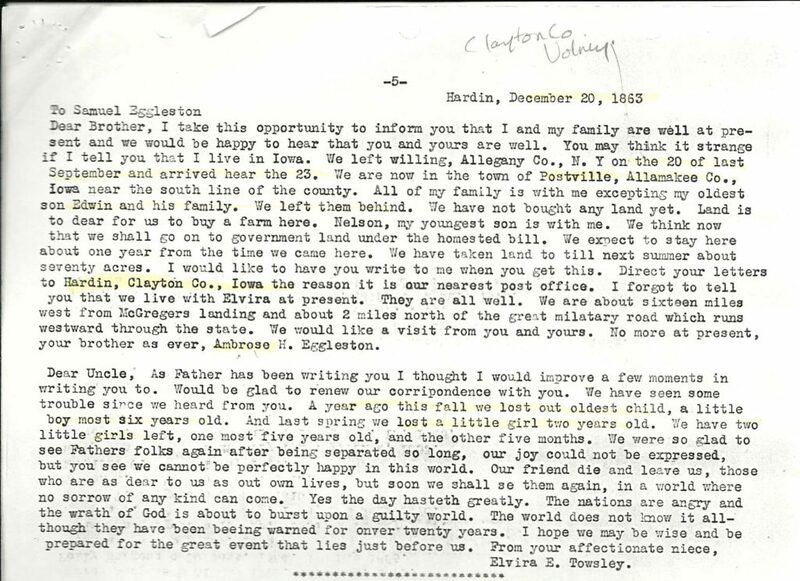 I recently took another look at this letter from Ambrose’s daughter Elvira. She mentioned the loss of her children. I was able to find her oldest son Chester on the 1860 Census, but the little two-year old girl is not on any records. The 1870 Census includes Gertrude who would be the five year old she mentioned as well as 2 other children born after this letter was written. The five month old daughter she mentioned was not with them in 1870, so she may have died young also. I wish she had mentioned their names. This letter was written in the midst of the Civil War, which apparently influenced her sentiments. Sadly Elvira passed away in 1872. 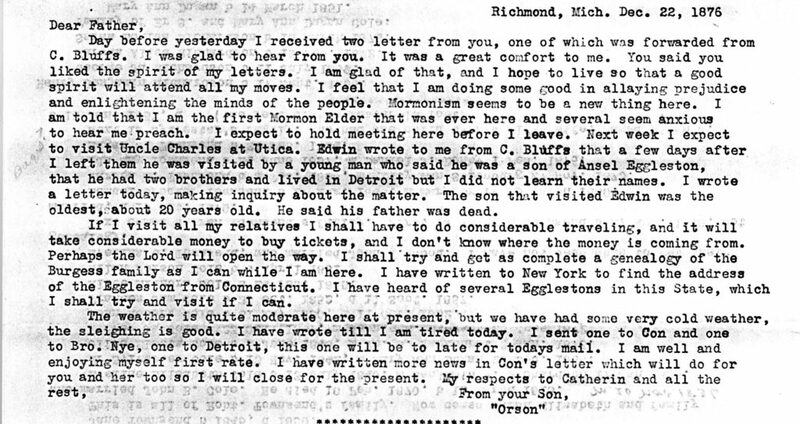 Orson sent this letter to his father while serving his Mission in Michigan. He mentioned that his brother Edwin had a visit from Ansel’s son. More clues but unfortunately, I haven’t been able to find any more about these sons of Ansel. 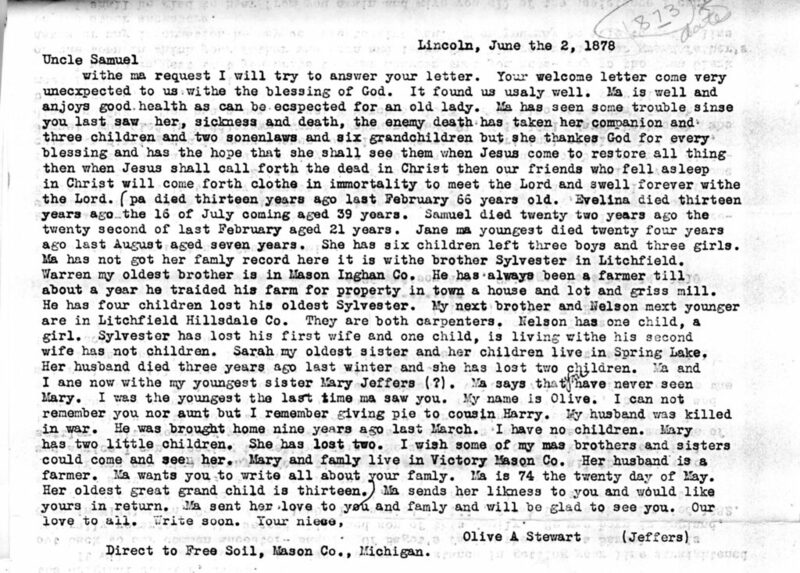 Olive Stewart, who was a daughter of Samuel’s sister Electa Townsend, sent this letter to her uncle. (My note questions the date of the letter. According to dates in the letter it should be 1873. It may be a typo) Olive’s youngest sister Mary, with whom she was living at the time she wrote, died in January 1874. Olive later married Mary’s widowed husband, Charles Jeffers. The (Jeffers) at the end was probably added by the transcriber. Orson Eggleston visited many family members while serving his Mission in Michigan. Apparently he corresponded with some of them after his return home. This post card from cousin Sarah Townsend Cole was in response to one he sent. Sarah shared information about the Skeels family. Anna Eggleston Skeels died in October 1874 and her husband Isaac died in October 1877. James Skeels’ son with consumption was probably Dorr who died May 15, 1879. Ambrose sent this letter to his brother Samuel. He mentioned the death of his daughter Elvira Towsley, who wrote the letter above. The birth and death dates were probably in response to a request by Samuel who was gathering genealogical information. 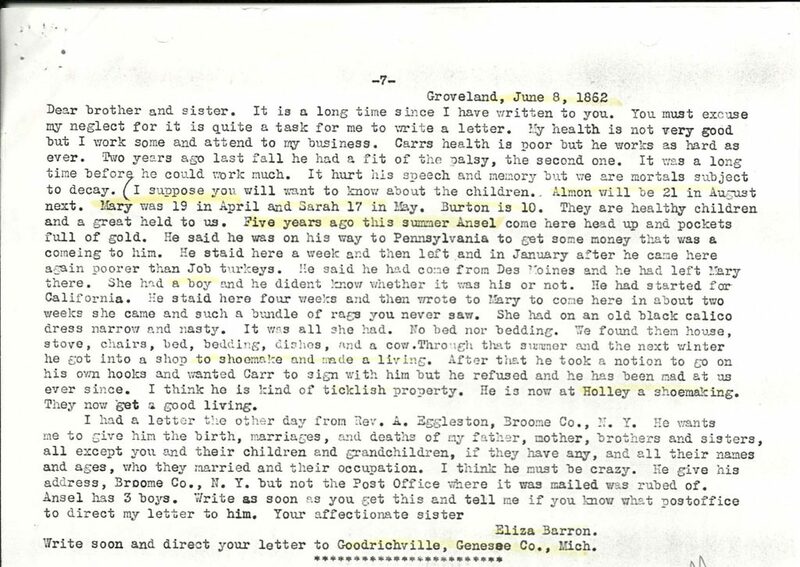 In the middle of this letter is a mention of uncle Benjamin Eggleston. Interestingly Benjamin was not included in other records of Orson H. Eggleston, including records of Temple work he did in 1914. I first found Benjamin through Onondaga County Land Records and determined that he was a son of Samuel Eggleston Sr. He was a brother of Samuel Jr. who was the father of Samuel and Ambrose. They obviously knew Uncle Benjamin well, but somehow this information was not well known to later generations. I find it interesting that Ambrose tells his brother that he and his sons were preachers of the Gospel. He even takes the opportunity to preach to Samuel. Samuel had joined the Church of Jesus Christ of Latter-day Saints in 1841. In 1877, he was called to be First Counselor in the Bishopric of the Ogden 2nd Ward. I have to wonder if there were more of these letters that have been lost. I also wonder if these particular letters might have been sent and kept in response to requests from Samuel for genealogical information, since they include many reports of deaths. We are fortunate that these family members made an effort to keep in touch as they moved away from each other and that someone made the effort to keep these letters. Note: Highlights and pencil notes were made by me on my photocopy of these letters. 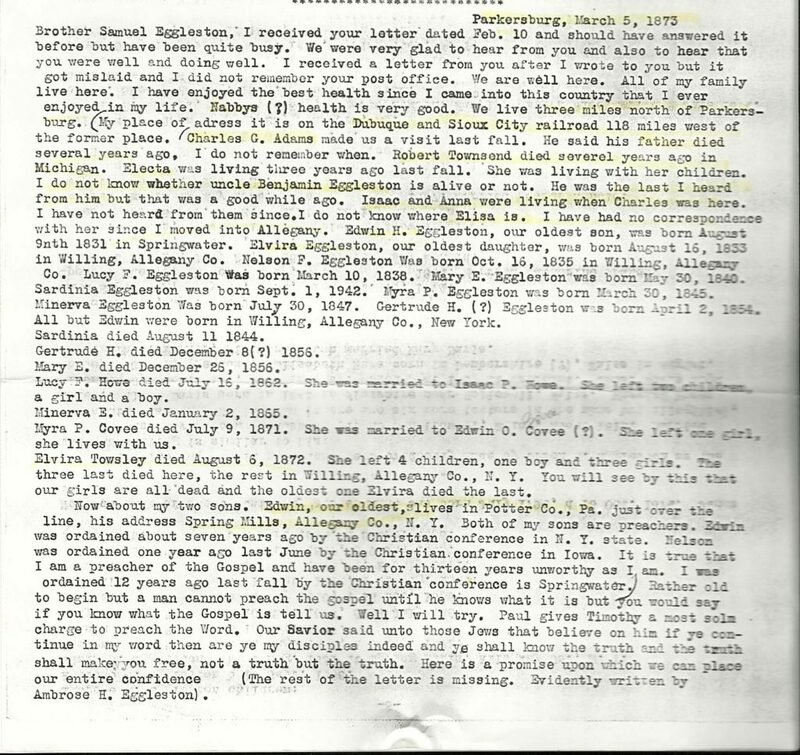 This entry was posted in Family heirlooms, My Stories of Discovery and tagged Eggleston, Iowa, letters, Michigan, research, Utah. Bookmark the permalink.